This talk was prepared and delivered for Strategic Planning Listening Session for BU Faculty on 2/13/19. It was also sent as a feedback to the Task Force on Evaluating Teaching. Below, purple color represents statements which have been deliberately omitted as a part of the talk, the blue color represents the statements added during the Session. 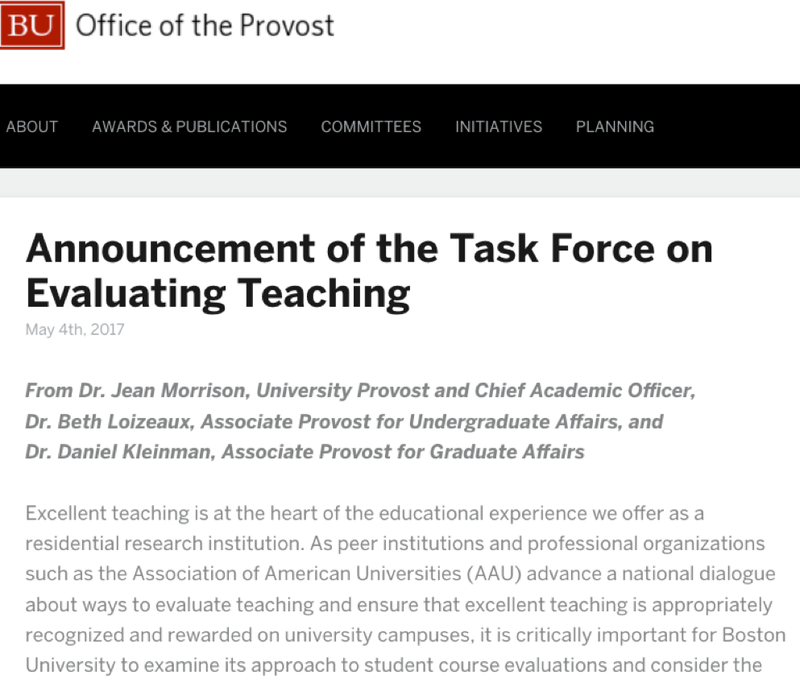 I would like to use 4 minutes to address “The Report on The Task Force on Evaluating Teaching”. It is directly related to the strategic development of the university. In the U.S. I’ve been teaching elementary physics since 2007. I am very good at that. My students write, quote: "I hated physics before taking this course, and now after taking both 105 and 106 with Mr. V, I actually really enjoy it. He is one of the best teachers I've ever had. Thank you"
Since 2007 I’ve collected about 10 pages of this stuff. One of the reasons I am good at teaching is that for a long time I already have been following recommendations presented in the report. 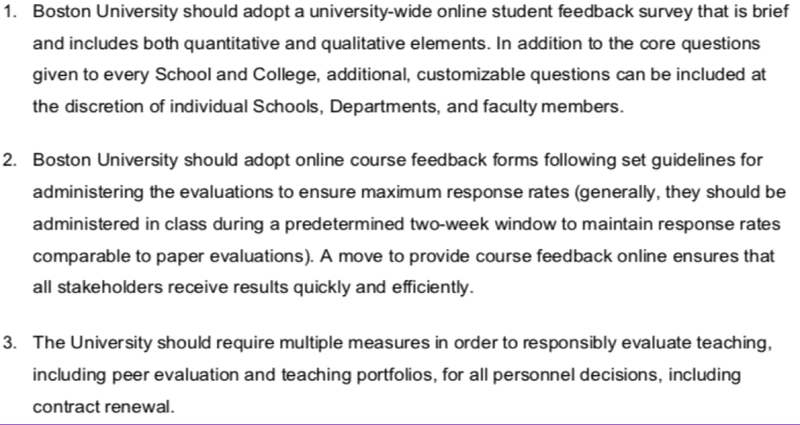 For example, I have developed my own survey that includes quantitative and qualitative elements, which I administer online. Every midterm and the final exams have a feedback page, so I collect feedback twice during the semester and then after the final. On the first day of the class, I tell me students everything about me, including my evaluations. So, I am a living proof that the recommendations will work. But based on my professional experience, I would recommend to look further. I have five specific suggestions. On page 23 there is a quote from Ronald Berk “There is no known objective methods for measuring teaching performance”. That was written twelve years ago. Nowadays there are, or at least in the development, objective methods for measuring teaching performance. Those methods did not find a reflection in the report. It is like visiting a theater and then reflecting on how good the performance was by judging the clothes of the actors, but ignoring what feelings one experienced. The practice of teaching results in specific changes called learning outcomes represented in skills and knowledge or abilities and competencies students gain by the end of learning. And for those outcomes there are objective methods for their measuring, at least in physics, math, chemistry. But the report lacks any specification of such outcomes. I believe that strategically, such learning outcomes have to become one of the criteria of the quality of teaching. The report does not mention what should be done if the quality of teaching has found unsatisfactory. And where is that cutoff between “satisfactory” and not? “Proposed Feedback Form” on page 17 has questions which in the current form will not be helpful. For example, an answer to question “How much did you learn” heavily depends on the initial background of a student. The percentage of the attended class meetings does not reflect option of using online resources. “What skills did you learn?” and “How well did you achieve learning goals” are basically same questions, and an average person would just repeat the list from the syllabus. Peer review section needs to include protocols for conducting an observation, describing and assessing activities of the instructor and the students. Finally, we live in the age of the big data. Every day some media outlet has a story about some new development in this area. The Report has no mentioning of this at all. 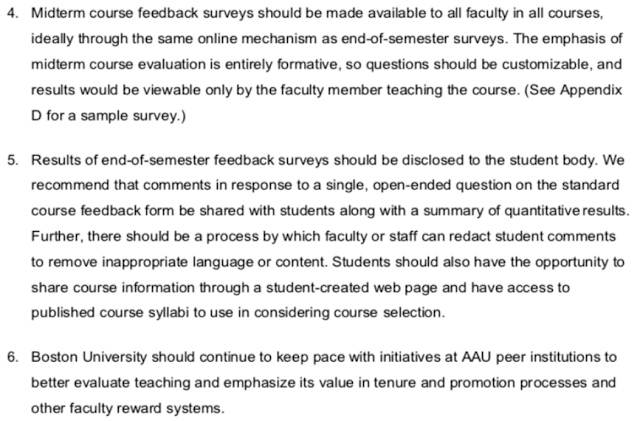 The proposed a university-wide unification of the student feedback alone will allow building a university-wide database. If this option is not a part of a Strategic Planning, this whole report is basically just a puff of smoke. 6. I do not feel that high quality teaching is one of the core values of the university. 7. University should intensify its effort for reaching out to low-income communities. It needs to replace fragmented events by a systematic learning engagement with the schools in those communities, maybe via its cultural centers like church. 8. University needs to establish a system to gauge in “real time” the mood in a student body. Having feedback about a specific course is not enough. University needs to collect and analyze feedback about various aspects of student life. 9. University needs to establish a system to gauge regularly how do BU graduates assess the education they get in university. Some time after the graduation a group from alumni may be surveyed on what aspects of BU education helped them, and what did not help them to succeed, what corrections they would suggest. The systems for gauging and surveying should become a natural part of the general big data approach for collecting and analyzing information on the functioning of the university. Appendix: A question to Dr. Bestavros. In your talk, you described many applications of data science. mining in general, and BU educational data in particular. Despite the fact that the opportunities are ample. For example, three years ago I offered a specific project in that area and you were one of the judges who declined it. evaluations and moving the evaluations online. This alone would produce a vast stream of data. any internal usage of the data analytics. My question is what is that specific logical element in your reasoning which prevents you from applying to BU education the same ideas and approaches you advocate for everything else? Appearances can be deceiving, in education, too. Venting Out About Customer Services.